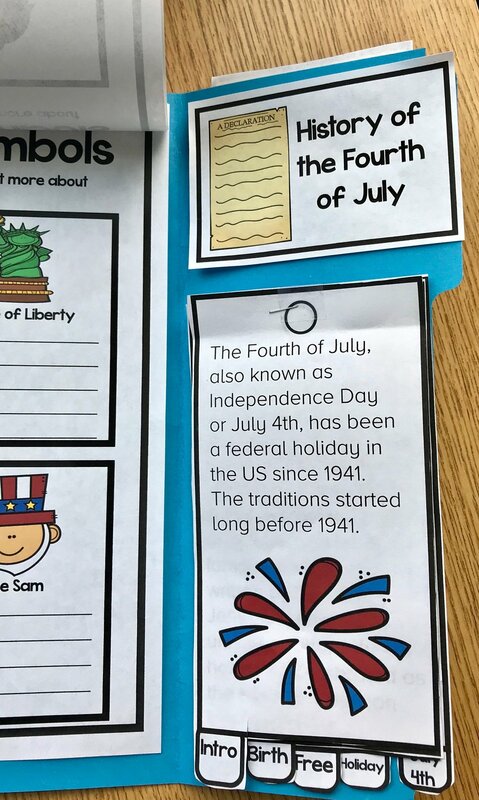 Fourth of July is the perfect time to get kids excited about the birth of America. Amongst the party decorations and the 4th of July crafts, lap books are a fun addition. Lap books are a great way to engage your children with content while adding some creativity to the learning process. Lap books are similar to interactive notebooks but can be more fun for kids. A lap book allows your children to have an organized product that they can learn from and in turn share with others. Lap books provide a creative collection of important and interesting information. The asking and answering question section also allows kids to reflect on the text. Higher level thinking skills are used to formulate questions about the topic. Finally, the middle section How I Celebrate the 4th of July can be a meaningful written piece or a beautiful illustration expressing special moments between children and their families. This space can also be used as a place to collect photos in a scrapbook type fashion. Anything goes! Now you have your fantastic 4th of July Craft for kids to make! You might even want to skip the Dollar Store and have a craft table at your next July 4th party! I hope your children enjoy this fun project!. I would love to see pictures of your final product. Be sure to snap a few and send them my way at tdeboree@trinadeboreeteachingandlearning.com!